The only difference between this circuit and what I actually have is that the motor's brake is implemented mechanically (irrelevant here) and speed control has not been implemented yet - right now the duty cycle of the xHI and xLI pins are all 20%. I am using trapezoidal commutation, and so I actually have 6 pins leaving the controller instead of the 3 in the diagram (I manually invert the HI pins in the controller). I know that my controller is parsing the Hall effect sensor inputs correctly and determine the correct state the rotor is in. I have also verified that the circuit is connected correctly. My main question is what is most likely to be the issue here? Could the issue be that my controller's clock speed is too low? (Using Arduino UNO but a Teensy 3.5 is available). Am I not providing enough current/voltage? Are my phases simply swapped? My motor's data sheet can be found here: https://www.anaheimautomation.com/manuals/brushless/L010758%20-%20BLK24%20Series%20Spec%20Sheet.pdf. The PWM frequency of the control signal. If you're using the analogWrite() function, it is only at a few hundred Hz. It'll control a motor, but be noisy. The behavior of the current limiting. Are you doing anything with the signal from the sense resistor going back to the controller? (most likely) The phases are not in the sequence that the commutation table expects. The motor datasheet shows that the Hall signals are spaced at 120 degrees, so that part is correct, but if the phases are in the wrong sequence, you can get a situation where the motor rotates to a point where the Hall signals change, and in the next sector the phases are energized to provide torque in the opposite direction, so the motor just oscillates back and forth around that point. Try swapping the phase leads around, there'll likely be one combination that works. 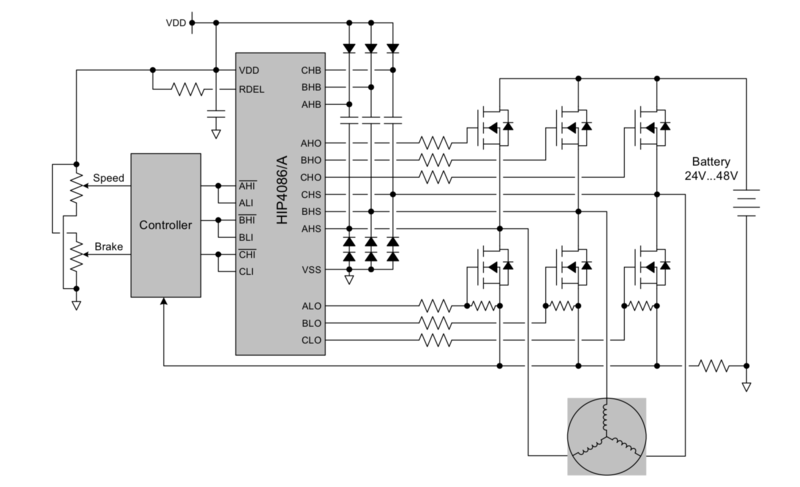 Control BLDC Motor without Microcontroller?